We’d love your help. Let us know what’s wrong with this preview of The Innocents Abroad / Roughing It by Mark Twain. This Library of America volume contains the novels that, when published, transformed an obscure Western journalist into a national celebrity. The Innocents Abroad and Roughing It (sometimes called The Innocents at Home) were immensely successful when first published and they remain today the most popular travel books ever written. The Innocents Abroad (1869), based largely This Library of America volume contains the novels that, when published, transformed an obscure Western journalist into a national celebrity. The Innocents Abroad and Roughing It (sometimes called The Innocents at Home) were immensely successful when first published and they remain today the most popular travel books ever written. The Innocents Abroad (1869), based largely on letters written for New York and San Francisco papers, narrates the progress of the first American organized tour of Europe--to Naples, Smyrna, Constantinople, and Palestine. 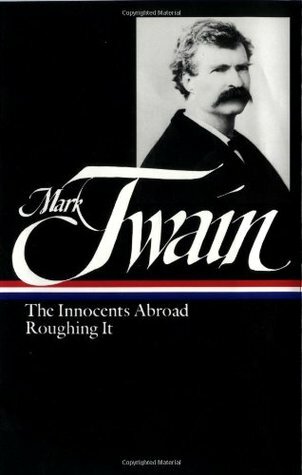 In his account Mark Twain assumes two alternate roles: at times the no-nonsense American who refuses to automatically venerate the famous sights of the Old World (preferring Lake Tahoe to Lake Como), or at times the put-upon simpleton, a gullible victim of flatterers and "frauds," and an awestruck admirer of Russian royalty. The result is a hilarious blend of vaudevillian comedy, actual travel guide, and stinging satire, directed at both the complacency of his fellow American travelers and their reverence for European relics. Out of the book emerges the first full-dress portrait of Mark Twain himself, the breezy, shrewd, and comical manipulator of English idioms and America's mythologies about itself and its relation to the past. Roughing It (1872) is the lighthearted account of Mark Twain's actual and imagined adventures when he escaped the Civil War and joined his brother, the recently appointed Secretary of the Nevada Territory. His accounts of stagecoach travel, Native Americans, frontier society, the Mormons, the Chinese, and the codes, dress, food, and customs of the West are interspersed with his own experiences as a prospector, miner, journalist, boon companion, and lecturer as he traveled through Nevada, Utah, California, and even to the Hawaiian Islands. Mark Twain's passage from tenderfoot to old-timer is accomplished through a long series of increasingly comical episodes. The plot is relaxed enough to accommodate some immensely funny and random character sketches, animal fables, tall tales, and dramatic monologues. The result is an enduring picture of the old Western frontier in all its original vigor and variety. To ask other readers questions about The Innocents Abroad / Roughing It, please sign up. What is the page number for, “Travel is fatal to prejudice, bigotry, and narrow-mindedness and many of our people need it sorely on these accounts."? I own this edition but I read The Innocents Abroad as it appears in The Oxford Mark Twain collection. Why? Because it has pictures. More on that later. This edition, published by The Library of America (L.O.A. ), is a quality copy, just like the rest of the series. The L.O.A. publishes handsome cloth-bound hardcovers with acid-free paper, sewn-in place-markers, etc., etc., they're quite elegant. I have a couple dozen because they look like they will stand the test of time. You see, I have this dreamy notion of someday passing down my personal library, a roomful of books, to my children--supposing they deserve it. I doubt the ingrates very much, if the future is even literate, but they're the reason I use the Library instead of wearing out the books I own. Posterity! However, I try my best to check out the same edition, same translation, binding, etc. as the one I own so that I can later reference my copy visually. I made an exception in this case. A word about The Library of America. *** Go to http://www.loa.org/ ***. There are some introductory subscription offers that are really worth the money, if you're interested in buying fancy editions ($40 each) for dirt cheap. You can take the offer and then cancel your subscription directly before you have to pay anything substantial. Currently, there is an offer for a three-volume set of Steinbeck or Twain in vanilla slipcases under $10. Whichever set you choose, it's a steal. And that is all the free promotion I will ever write. This is classic Twain. He is an endless amusement. When I first discovered how much pleasure I derived from his works, I promised myself that I would ration them out over my lifetime and not read them all at once, so that I could always have some fresh Twain. I thought The Innocents Abroad was exhausting, in the way that most travel is exhausting ... on the memory. There are a number of scenes I won't soon forget. The times I fell asleep reading it, Twain's images slipped into my nightmares. Not that he inspired them--I have nightmares more often than not--but now they featured minarets, beggars, and Bedouins. Twain's historic and religious reflections are priceless for their mix of gravity/levity; he never misses an opportunity to put the Catholic Church on blast and he shows surprising compassion for Muslims. His own American folk stories are interspersed with impromptu imaginings of European life, and apocryphal versions of Biblical tales abound. There are far too many funny incidents to mention. The biggest and most sustained laugh I had was when he was describing the famine in Samaria brought about by a Syrian siege. It closes Chapter 51, for anyone that cares to look. Unlike Twain's other works that I have read, this seemed very dated. It began very dry, for the first two hundred or so pages; perhaps because I know many Moslems and Jews (to say nothing of Europeans) they do not seem "exotic" to me, which the interest of this section was based on. After the pilgrims reach Rome, and even more in the "Holy Land", the book becomes more humorous, mainly at the expense of the Catholic Church and its relics, and there are a few passages that dimly foreshadow the author of the diaries of Adam and Eve, but for the most part nothing that would shock a Protestant audience. It's not entirely clear today when Twain is seriously making fun of the Moslems et al. and when he is satirizing the ignorant attitudes of the Americans, so the book in its original context may have been funnier or less so than it seems now. Roughing It is entertaining but for me it was a little much with all the mining and everyone killing each other. I know he was exaggerating and just trying to make life more interesting but it did start to bore me. I did enjoy reading about the West and Hawaii before most places became states. I think that is why I like reading books from the 19th century, some settings are familiar yet, not so familar. Innocents Abroad was my favorite. I loved reading about the trip and his take on everyone he m Roughing It is entertaining but for me it was a little much with all the mining and everyone killing each other. I know he was exaggerating and just trying to make life more interesting but it did start to bore me. I did enjoy reading about the West and Hawaii before most places became states. I think that is why I like reading books from the 19th century, some settings are familiar yet, not so familar. I keep slogging through this book. I thought I liked Mark Twain. Maybe I only like liking Mark Twain. I finish it someday, but the library'll want it back before I get there this time. If nothing else, I know I like this quote of his- "I have found out that there ain't no surer way to find out whether you like people or hate them than to travel with them." I have to say that I enjoyed Twain's "sketches" of people and his political commentary in his autobiography much more than I enjoyed Innocents Abroad. I didn't read Roughing It -- should I? Roughing It is the better written of the two, but both are riotous accounts of travel. The Innocents Abroad should be required reading before anyone travels to Europe. The Old World seen through the New World's eyes (I previously read Roughing It separately), i.e., stripped of sentimentality and superstition. Great read. Read a couple of years ago. This book is amazing. I can't believe it took me 60 years to discover Twain's non fiction. If you like travel or history, read this. A timeless read for anyone traveling to Europe or the Middle East. Mark Twain is great fun and this book is full of wonderful anecdotes and hilarious discussions. ROUGHING IT: I rate this book 4 of 5 -- EXCELLENT. It's pretty funny. Mark Twain gets a little snarky. But it is entertaining at times. First read-through from 09-Dec to 28-Dec-2016. Nothing better - biting satire, transcendent humor; all by the Master. Twain's travel writing, as showcased in these two novels, is fantastic, full of black, sarcastic humor in addition to descriptions of the world and country that no longer exist today. Twain grew up in Hannibal, Missouri, which would later provide the setting for Huckleberry Finn and Tom Sawyer. He apprenticed with a printer. He also work Samuel Langhorne Clemens, better known by his pen name Mark Twain, was an American author and humorist. He is noted for his novels Adventures of Huckleberry Finn (1885), called "the Great American Novel", and The Adventures of Tom Sawyer (1876).